Of late, pelvic floor function is a hot topic. 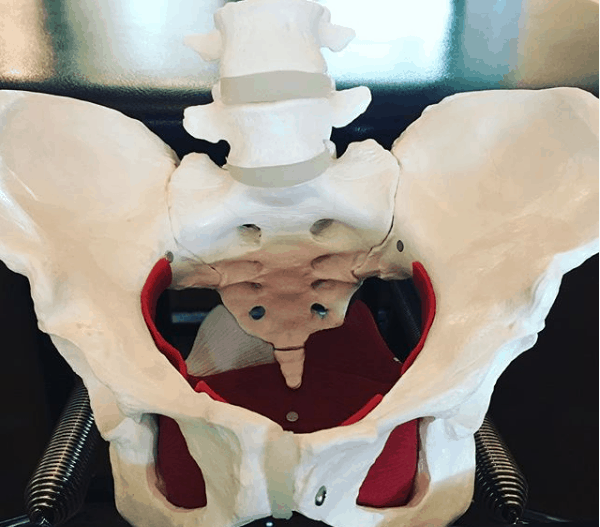 Not the coolest of topics I would have thought … but so very important to lower body function that it is often the missing link in addressing low back, pelvic, hip or knee pain. Anyone working in therapeutic movement in the last 15 years has known how significant PF function is for healthy movement. What seems to have changed is the fitness and clinical world’s acknowledgment of the critical difference between PF strengthening and PF function. As many people frustratingly discovered: strengthening the PF can lead to greater dysfunction of the PF. First of all, what is the pelvic floor? Muscles spanning the base of the pelvis that form a diamond shape connecting the tailbone, pubic bone and sit bones. Contraction of the pelvic floor muscles results in a scooping under of the tailbone and sacrum (the full triangular bone that the tailbone is attached to). It is critical that the sacrum can glide between this scooped under position and a release (tailbone out) position. There is not a lot of movement here but like many parts of the body it’s these micro movements that help to transfer load and avoid too much compression. How can strengthening lead to greater dysfunction? If we focus on simply strengthening the PF through kegels (PF contractions) we risk drawing the sacrum further and further into a scooped under (counter nutated) position where is doesn’t release to a full range the other direction (tailbone out). This can be particularly true if the kegel exercise is practiced in poor posture and when the release element isn’t given adequate focus. What’s so bad about a constantly scooped under sacrum? Instability of the lower back vertebrae and SI Joints, poor position of the hip sockets resulting in tight (hypertonic) hip flexors a that can affect patella tracking at the knee. If you do kegels and don’t want to give them up pay attention. Can you allow the pelvic floor to fully release each time? Squats can be a great way to lengthen PF muscles but you need to be able to release the PF first. The Franklin Method approach offers some great imagery and awareness techniques. Register for our next FM Pelvic Workshop in the fall.